'Supernatural' Recap: Could Sam and Dean Really Close the Gates of Hell? Probably Not. ‘Supernatural’ Recap: Could Sam and Dean Really Close the Gates of Hell? Probably Not. Just when we all thought the trials to close the gates of hell were taking their physical toll on Sam just to make Dean’s life even more difficult, as per usual, then Supernatural turned it around and delivered an emotional shocker that stunned Dean and viewers alike. The trials are actually purifying Sam, diluting the demon blood he’s had in him since the yellow-eyed demon polluted him as a baby. Sam’s health is getting worse so he can actually get better. The look on Dean’s face said it all when Sam explained this to him: whoa. Heavy stuff. Obviously, Dean is still worried about Sam, but this revelation is actually a good thing. If the trials really are purifying Sam so he can complete the task of closing the gates of hell, maybe there actually is a happy ending somewhere down the line for the Winchesters! But shh, we won’t jinx it. Knowing this show, something bad is about to happen. Too many good things happened in “The Great Escapist” and we all know the Winchesters don’t have the best luck. First off, even though it turns out that Crowley did kidnap prophet Kevin Tran (so he wasn’t going crazy and imagining things! ), Kevin didn’t fall for the King of hell’s fake Sam and Dean charade – not difficult, seeing as how the demons pretending to be the Winchesters clearly didn’t do their homework. That was the worst Sam and Dean acting I’ve ever seen! Kevin didn’t give up the tablet’s secrets, but he did translate Crowley’s half so when Sam and Dean rescued him, he was able to tell them the third trial: they have to cure a demon. Wait, what? But back to Kevin being rescued: Sam and Dean weren’t the real heroes. They actually traveled to find the Word of God, a.k.a. Metatron, and what they found was a shut-in recluse of an angel who was so hidden from the world that he hadn’t even heard of the Winchesters. Sam’s complete shock and look of offense when Metatron had no idea who they were was completely perfect. Everyone in the supernatural world knows of these legendary brothers. But Metatron didn’t even know what was going on with heaven and hell, so we’ll begrudgingly give him a pass. Once Sam and Dean caught Metatron up on all the recent goings-on in the supernatural war, he transported Kevin Tran from Crowley’s clutches back to the brothers, and healed him. And that sneaky little prophet also stole Crowley’s half of the demon tablet! Score another one for the Winchesters. However, the bad to balance out the good was the fact that Crowley tracked down Castiel (after Naomi found him first) and stole the angel tablet from inside Castiel’s stomach. That scene was brutal and incredibly tough to watch. So the king of hell has the angel tablet and is in a race against time and the Winchesters to close the gates of heaven before they close the gates of hell. Good thing Crowley doesn’t have a prophet to translate his tablet, and the Winchesters are already on their third trial! So of course, another piece of bad luck to once again balance out the good is that Castiel is not in good shape after Crowley’s emergency surgery to extract the angel tablet from inside of his stomach. I mean, duh, of course he isn’t going to bounce right back from that. But the Winchesters found him laying in the middle of the road, so hopefully they can help him heal in some way. Question: now that the angel tablet is no longer inside of Cas, will he be susceptible to Naomi’s mind control again? The constant touching of the tablet was how Cas was able to block her manipulation. Could Cas become a weapon against Sam and Dean again? Say it ain’t so! The final score: Crowley has the angel tablet with no way of translating it, the Winchesters have the entire demon tablet, Kevin Tran, and the directions to complete the third and final trial, Naomi has nothing, Cas is back with Sam and Dean but in rough shape… with only two episodes left until the season finale, who wants to bet something really bad is going to happen? Fake Dean: It’s me. [Kevin sprays him with holy water] Now it’s a wet me. Dean, to a sickly Sam: Want me to do the whole airplane thing with the spoon? Dean: They taught Word of God at Stanford? Castiel: In the words of a friend, bite me! Sam: You rode a fart-y donkey!… I’m going to follow the hotel manager, Mr. Scowly Scowl. He’s like a villain from Scooby-Doo. Dean: No, you should get some rest. Sam: Yeah, I could do that, too. Sam: Wait, you haven’t heard of us? What kind of angel are you? We’re the friggen’ Winchesters! Crowley: So… my demons were… too polite? Crowley: Well, I’ll be a son of a whore. 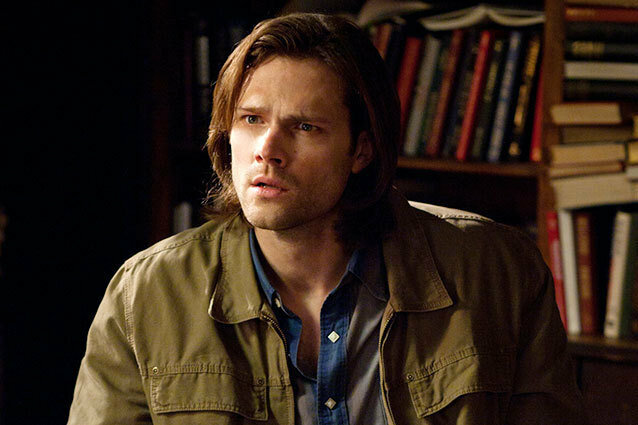 ‘Supernatural’ Recap: Welcome to Hunter University!